After the Rebels game in Melbourne we took the chance to escape from the Lions tour and headed down to Hobart for a couple of days before returning for the second test. Staying six nights in Melbourne, especially in a hotel that few in the party liked, seemed too much and we were glad of the chance to visit Tasmania for the first time. Once there, we were delighted with the hotel (Leena of Hobart), the beaches (mostly deserted and sandy), the restaurants, and the two attractions that we visited on Thursday. 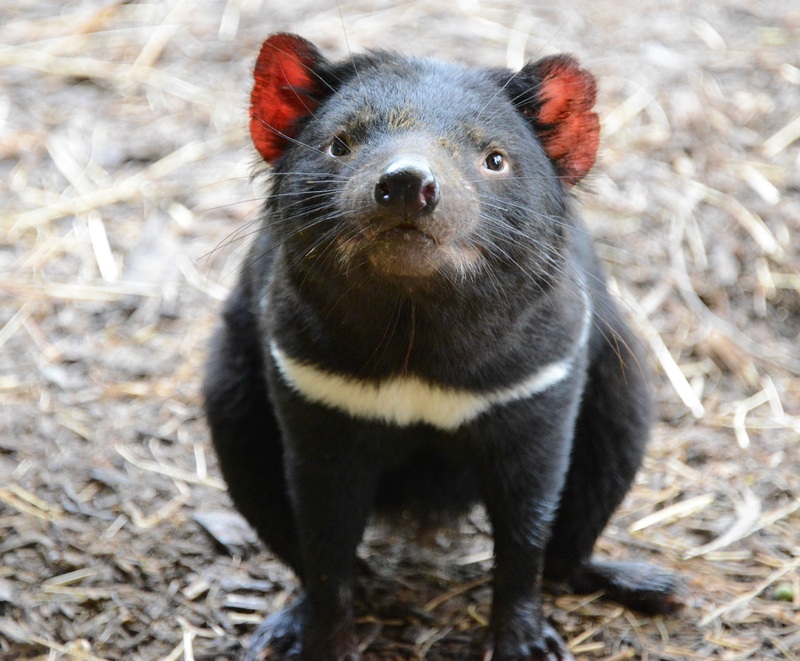 As its name suggests, the Tasmanian Devil Park at Taranna focuses on these small, apparently cuddly but absolutely vicious animals. Feeding time at this zoo was neither peaceful nor cheerful as the devils tore into what seemed to be half of a dead animal. Poking a finger over the fence wasn’t recommended and after looking at how a devil can reduce a lump of meat to nothing in a few minutes we know why. The park also features birds, wallabies, kangaroos, and other Australian mammals and was an interesting place to spend a few hours. 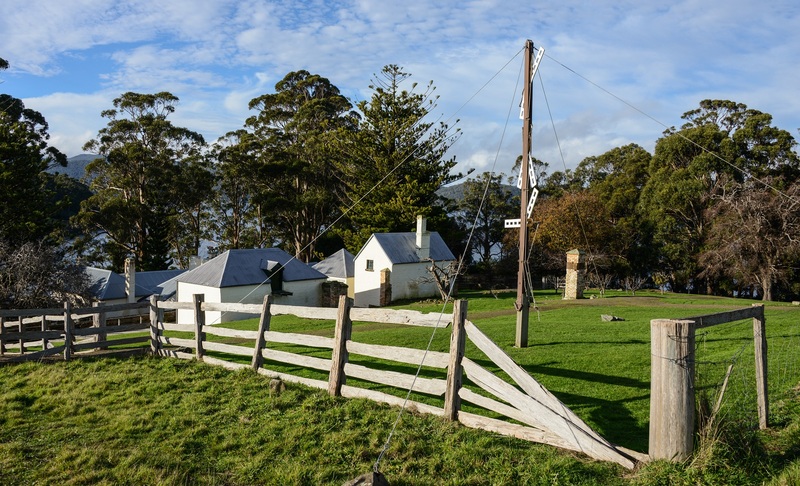 Later on we arrived at Port Arthur, a site dedicated to the memory of the penal colony that operated here from the 1830s. It’s quite a place to visit. A number of buildings from the penal colony and later are preserved in different states. The commandant’s house, for instance, is reasonably complete while the penitentiary and hospital are in ruins. A good visitor center and exhibition makes an interesting start and a 20-minute boat tour around the bay provides an excellent perspective of what it must have been like to enter Port Arthur in the past. Definitely a recommended place to visit if you are in the vicinity, even if the 95km drive out from Hobart is long because of the winding single-lane carriageways. The drive took us through the areas devastated by the bushfires in late 2012 and early 2013 and it was surprising to learn that only a hundred or so houses had been lost given the amount of damage visible from the road. We headed back to Melbourne through what must be the easiest airport transition that I have had in some time. If only every airport was as empty, calm, and peaceful as Hobart (HBA)! En route we took a small diversion to walk on the aptly named Seven Mile Beach, a wonderful spot that is only slightly disturbed by the planes landing at the nearby airport. Saturday was occupied with minor housekeeping like laundry (a necessity on a 22-day trip) before we could concentrate on the second test in the Etihad Stadium, a marvellous location in Melbourne’s revamped docklands. Because we’re part of a tour group that provide match tickets we weren’t aware of the ticket cost for the first test. This time round the price was printed on the ticket and we were amazed to find that Ticketmaster had charged AUD$240.21 (about EUR185) for a “Gold” level ticket on Tier 3 of the Etihad Stadium. In practical terms this means that we were between the 22m and half-way line in the third tier, about 50m away from the pitch. Unlike the SunCorp Stadium in Brisbane or all Six Nations grounds, the Etihad curves to accommodate Australian Rules, so you end up quite a bit away from the action. Paying such a large amount for what really wasn’t a great seat came as a bit of a shock. I certainly won’t complain too much when the IRFU ask for EUR100 for much better seats in Lansdowne Road for a Six Nations match or a game against New Zealand or another headline nation. 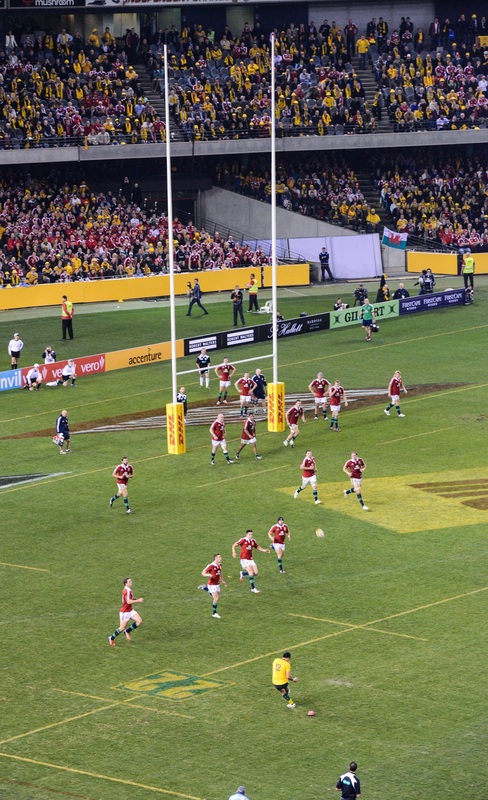 It seems like the Australian Rugby Union has taken every opportunity to extract money from fans on the Lions tour. Being so far away and so high up and on a curve, the pictures from the game are very different from the norm. 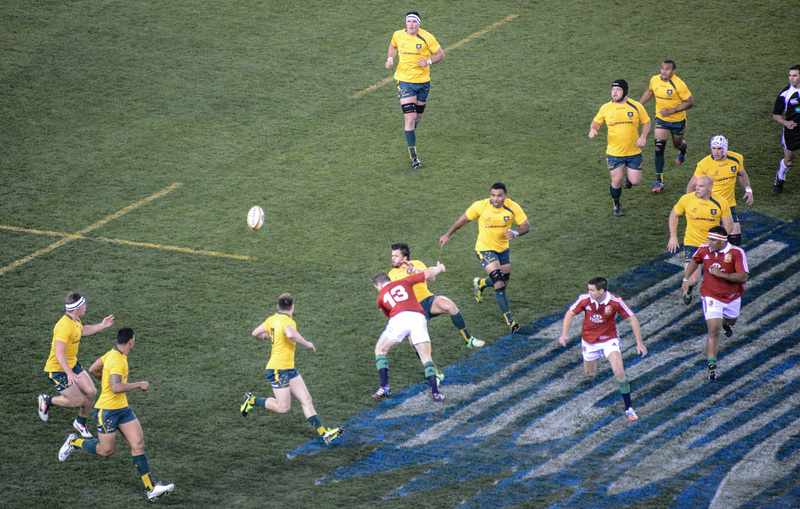 However, I like the perspective in the shots, especially those of Tommy Bowe facing a group of tacklers or the player reaction after Brian O’Driscoll smashed into his opposite number. 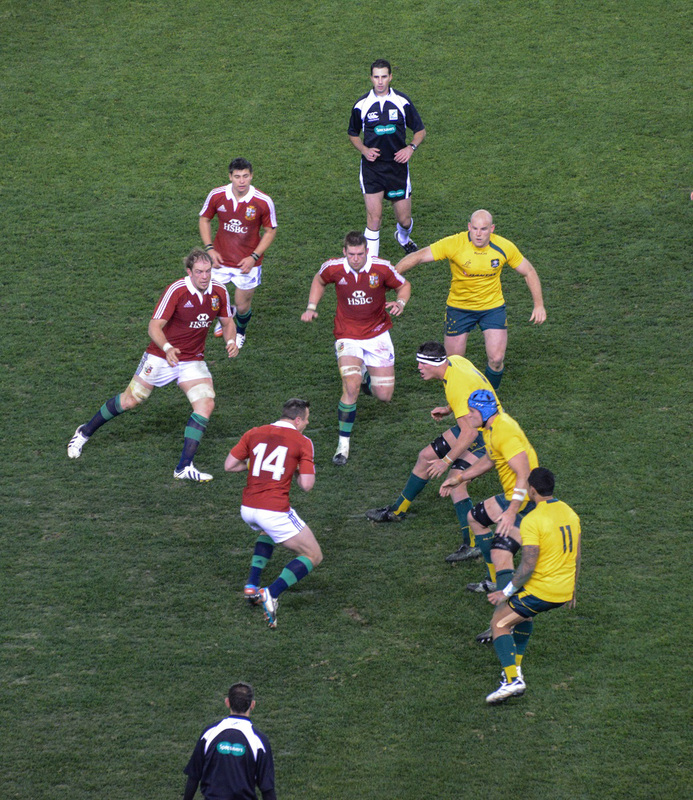 The game itself was not one for casual viewers as it offered little in the way of obvious highlights such as the tries scored in the first test. Instead, this was a full-on tense encounter with many forced errors and stoppages. The atmosphere in the stadium was charged from start to finish but I wonder how many people actually enjoyed watching the game simply because of the pressure that steadily developed as time advanced. Being a referee, I was amused by how many spectators are able to detect marginal forward passes and offsides from such a distance, especially when movements are executed at real pace. The beer being consumed in the stands obviously helped to increase the accuracy of their observations. The tour group has moved on to Cairns for some non-rugby downtime before going to Sydney for the deciding test next Saturday. Melbourne airport was chaotic yesterday because Virgin Australia had oversold a flight to Cairns, which affected another tour group. The resulting confusion took quite some time to resolve but the flights thereafter were uneventful. This entry was posted in Rugby, Travel and tagged Brian O'Driscoll, Lions Tour 2013, Port Arthur, Tasmanian Devils, Tommy Bowe. Bookmark the permalink.